So this is the 'Freshman class of 2013'. Well that doesn't mean that they will graduate in 2017, it just means that they arrived at Safe Harbor this summer! They have all spent the required week or so alone in a pen adjoining the horse herd and we've made sure they were healthy and that their injuries wouldn't be too much for running in the big pasture. They've been accepted now by our gelding in charge (Memory) and second in command (Paint). And the all important lead mare (Zsa Zsa) has given her approval! But instead of fully integrating into the ranks of the herd, these 4 have chosen to keep hanging out together. It's not that they are all timid spirits, actually I sense that one of them will end up being quite in charge, but for some reason they have been enjoying security in being a quartet! So, like anxious freshman everywhere, they are sticking together at the lunch table! (Individual stories to follow on our 'sponsorship page'). How did somebody know I wanted a donkey?? For several months now, actually more like several years, I have been thinking about donkeys. I don't know donkeys...have no idea how they behave, who they are, what they do. I just knew I wanted one, or perhaps two. I almost took in two donkeys this spring, but the person who was giving them up decided she loved them too much and kept them! And now I know why! This month we were asked to take these two amazing Mediterranean Miniature Donkeys..and they are wonderful!! I still don't know much about how they behave, who they are or what they do, but I know they are adorable...take a look at those beautiful faces!! .....and they are engaging (they want to be in the house..) sweet tempered (although they show me that they weigh several hundred pounds when gates are being opened)..and best of all they get along with the sheep. 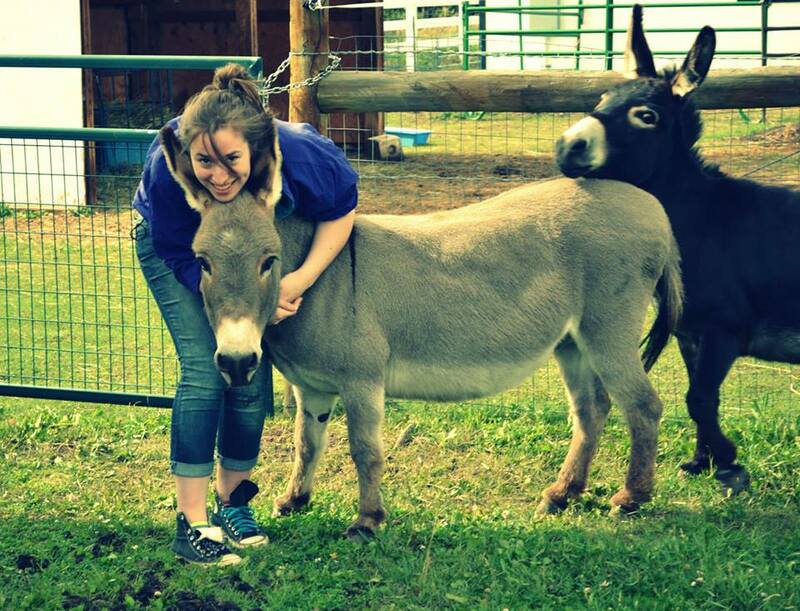 I love these donkeys! Look who showed up at Safe Harbor! Sometimes great things just happen here! Out of the blue, we were asked by a local couple to please take these beautiful alpacas!...and their guard llama! Here they are on the day they arrived, getting used to the new pen and looking back at the Jacob's sheep, who might be pretty intimidating with their 4-horned head gear! These guys are wonderful and they have beautiful fleeces which we will have made into yarn this fall. They are so gentle...and they have the most adorable little sound..sort of a 'mew'. But that sound does mean they're on edge, so silence is what we want in the alpaca pen. And this guard llama means business. I have named him 'Maria', although he's a male and the suggestion has been made to call him 'Mario'. 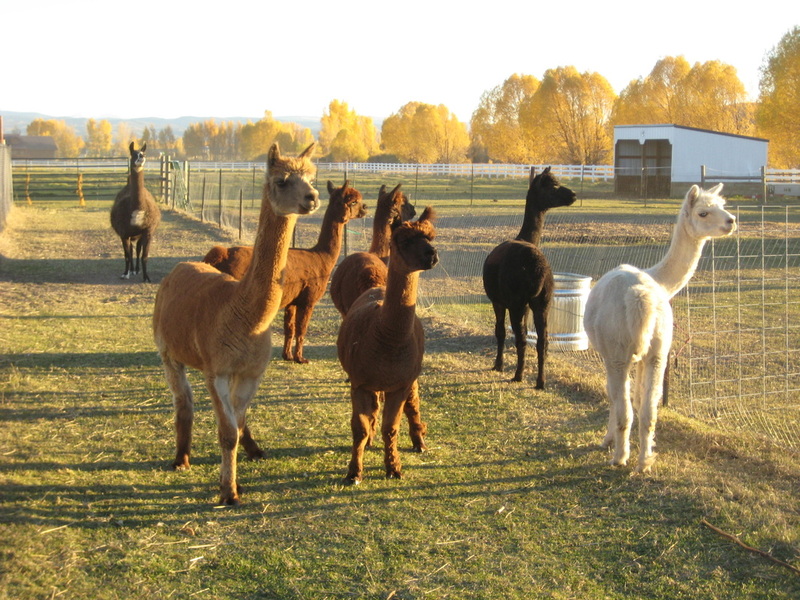 Oh, and the names of the alpacas are 'Star', 'Midnight' and 'Fawn' (for the obvious colors). And the 3 little brown ones just had to be 'Frodo', "Samwise' and 'Pippin'. ...you tell me why. Look for their close-ups on the sponsorship page! A blanket and bucket of grain. It is a challenge to run this rescue ranch. I so want to provide a comfortable home for elderly animals and give them the respect and peace that all elderly creatures deserve. And I know this means that I will witness the end of many lives. I must learn to embrace the sadness of our losses and then feel the joy in their moving on, knowing that they felt loved and wanted at the end. 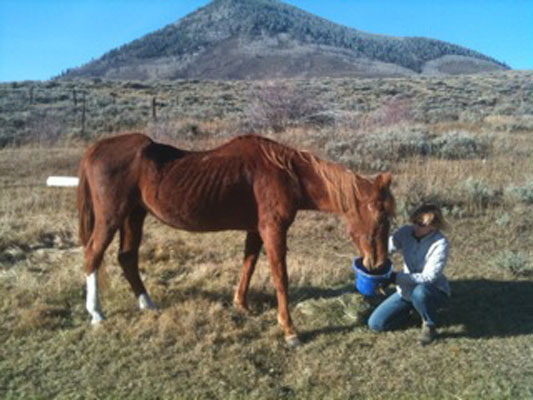 This winter we lost the gracious and noble Missy, a 34 year old quarter horse who had spent her life as a trail rider. In her later years she had become very thin and frail. When she came to Safe Harbor, got into a warm blanket and realized there would be a bucket of grain for her night and day, she began to greet me at the fence. We heard her nicker after she stayed with us a few weeks, finding her voice after she knew she would have enough energy to speak. She was gentle and curious and we could see how happy she was in her new home. She was only with us for a month before her physical problems and advanced age got the better of her. I waited for hours that night before allowing our veterinarian to help her pass, not wanting her to miss a single moment of her existence. Malaya, our 'grandma sheep' needed a quiet, nurturing place in order to thrive. 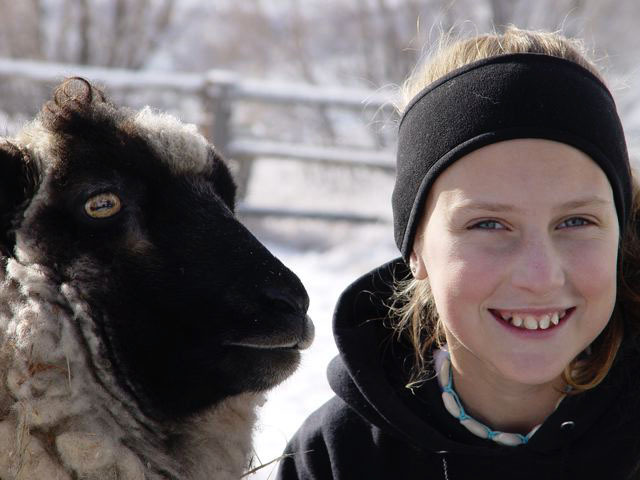 It was easier a few months later when I lost our oldest Shetland sheep, Malaya. Malaya was at least 12 years old and had been with us for 5 years. She was brought to me by a careful shepherdess who realized Malaya was unhappy in a large, breeding herd. I was told she needed a quiet place. At Safe Harbor she lived with 7 Shetland sheep and 2 watchful llamas. Her life was calm, full of sunny Colorado summer days and a warm barn during our cold winter nights. Malaya loved to be petted and I spent countless hours at her side stroking her head. Her tail would wag with delight and she would paw at my leg if I stopped scratching her. She never tired of my company and I smiled every time she approached me for affection. Malaya became well known in the neighborhood as our 'grandma sheep' and people would come by to sit with her. Why did I say her passing was easier? Because I found her one morning in her sleeping place in the barn. She had passed in the night. And although I felt such deep regret that I was not with her when she died, I was relieved that she was able to leave in her own time. So much to learn about these things. So much to observe. Two perfect lives. And a privilege to have shared time with each of them. Thirty days later, Yellow stood at the entrance of that pasture, nickering for cookies. We realized that we had an injured horse on our property with no shelter for him, no horse fencing to put around him and, of course, a storm was predicted for the next day. We quickly located a weather-port shelter; neighbors appeared with panel fences, buckets of grain, hay bales, and vitamins. Soon, they changed their dire predictions to good wishes. We pressed our vet for quick instruction on what to do, and although she continued to warn us about getting our hopes up, she taught us to administer antibiotic injections and pain killers. We soaked the injured foot twice daily in vats of salt and antiseptic, cleaned the wound and kept it open and draining, and wrapped it twice daily in mountains of baby diapers and duct tape. And before we realized it, Safe Harbor Ranch was born -- right there in the north pasture. Were we lucky? Yes, without a doubt. All of our efforts could have been to no avail. But we got to Yellow just in time. We stopped the infection from worsening. We did it. We did it. And we said to each other, "That wasn't so hard." Oh, and Yellow still prefers that weather-port shelter, though we now have a horse barn. We call it, "Yellow's House." When I moved to Colorado in 2003, the thought of getting anywhere near a thing as big as a horse seemed improbable, if not terrifying. However, having settled on fourteen acres that seemed rather lonely, I agreed to allow a friend's horses to graze on our pastures. I found the horses pleasant and peaceful to look at. However, when asked to feed them hay over the winter my response was, "You mean, get in the pasture WITH them?" She not only laughed, but insisted that in the next spring she was determined to teach me to ride. "Ride?" I said. "You mean ON the horse?" My growing up in Chicago, and then living in New York for twenty years, had given me vast experience in many areas of life. But getting atop a horse! I remember the first time I visited the fourteen acres I would eventually purchase and was afraid to walk out onto the pasture for fear of what might be lurking in the tall grass. I was told by a gentle realtor that there were no poisonous snakes at this altitude in Colorado so I should feel free to wander about. I walked down the road and viewed the acreage with binoculars. But was I going to wander about? Was I going to ride a horse? The questions alone frightened me. But these are stories for another time. Push ahead three determined years and until I write them, imagine the stories outlining my adventures in feeding, grooming, and horseback riding the trails around Gunnison and Crested Butte. Why I pressed on, instead of running at full speed back to the safety of any big city, I will never know. Perhaps I felt deep inside that my future was linked in some way to these immense, thoughtful animals. Enter, the first true test, when this same friend -- the one who first pastured her horses on my property -- alerted me that there was a horse in trouble in a pasture and asked me to come look at him, I had no idea what to expect and wondered why she thought I could be of any assistance whatsoever. When I spotted Yellow rocking back and forth in a field, barely able to stand or get to grass or water, with a leg swollen to a size comparable to his neck, something incredible happened. Not only did I spring into action, I walked right up to him, put hay in his mouth and held a water bucket for him. No worries; no panic. I borrowed a trailer, found the horse's owners and pleaded for them to release Yellow to my care. After receiving the okay, I called a vet and secured the help of several strong friends. They half-pushed, half-lifted Yellow into a trailer, and then brought him to my ranch. As he lay down on the ground groaning while many well-meaning neighbors and friends surrounded the scene telling me to "put him down," my husband and I announced we were going to try to save this horse. Whispers abounded. "But they're from New York. "They don't know what they're doing." "They will just prolong his suffering with their emotional response." "He's had a good life and now it's his time." "It would be selfish to put him through any more." "That leg can't possibly heal." "He's in pain." 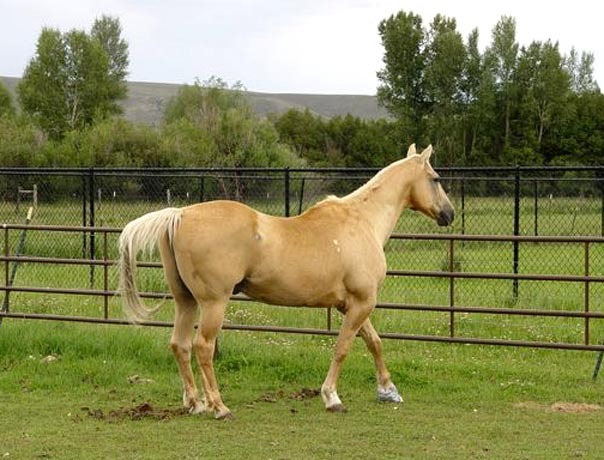 An x-ray and a phone consult with an equine surgeon should have sealed Yellow's fate. We were told he had not even a 10 % chance of survival. Well, that did it. The spring into action now became a full court press. 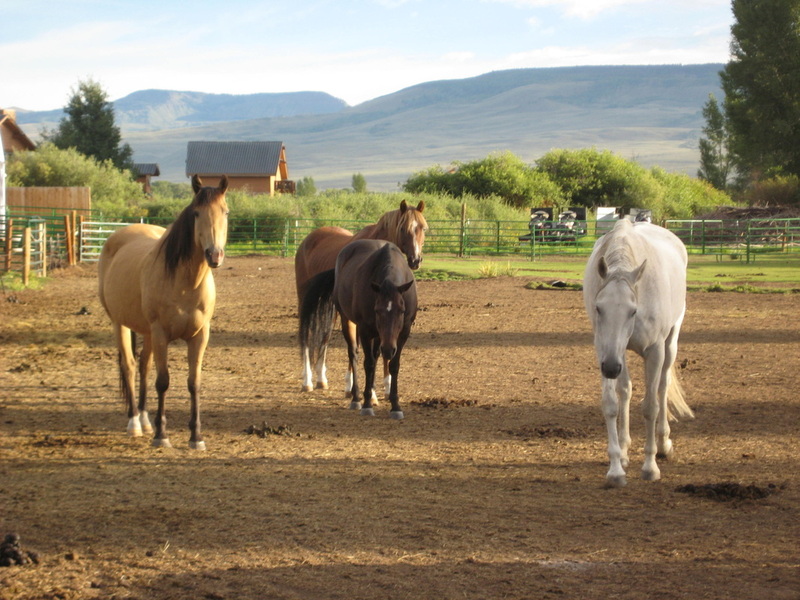 Terry Bonney shares her experiences of caring for animals in need at Safe Harbor Ranch in Gunnison, Colorado. We are located at 700 Sierra Vista Way and welcome visitors Sundays from 11-1. Please call 970-642-0114 to make an appointment.